Director Family Welfare, MCH, and Immunization Dr Samir Mattoo and Additional District Development Commissioner Mehraj-ud-Din on Monday jointly inaugurated Measles-Rubella immunization campaign from specially-abled children at Abhinandan home in Solina. Dr Mattoo said the administration was keen to cover entire 37, 72,960 children population within the age group of 9 months to 15 years in the state, as part of Government of India’s initiative to eliminate Measles and control Rubella by 2020. 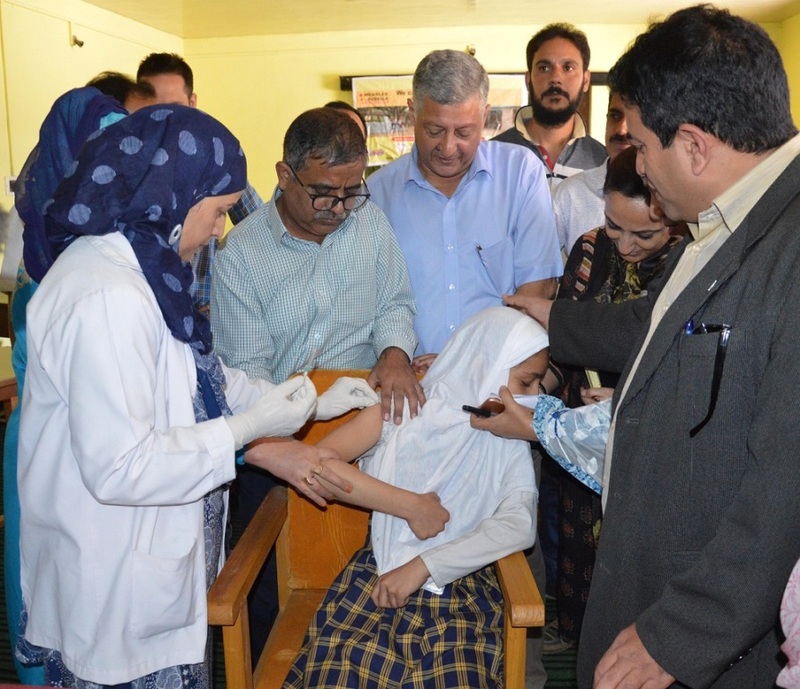 In Srinagar district alone 3, 07,002 children are targeted to be covered under this immunization programme. Around 691 children were vaccinated on the first day in four zones and one medical block in Srinagar district. The Director said that the immunization programme is being conducted to prevent children from catching highly infectious and potentially fatal viral diseases like Measles and Rubella that continues to kill infants and young children. He said that the Congenital Rubella Syndrome (CRS) is an important cause of severe birth defects due to Rubella diseases and passes on from mother to her offspring. He also said that among 37, 72,960 children, 80 percent of the target population are school going and as such schools shall receive maximum attention. The children will be covered in 29,382 schools across the state by 6062 trained vaccinators from the Department of Health. Principal Abhinandan Home Shameem Lone, Chief Medical Officer Srinagar Dr Talat Jabeen, besides officers from Social Welfare Department, ICDS and other allied departments were present on the occasion.